Crock Pot Chicken Chow Mein can be made right at home! 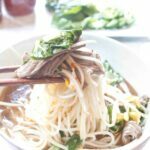 It’s so much easier (and cheaper) than getting take out but just as delicious! Yes. You heard me. 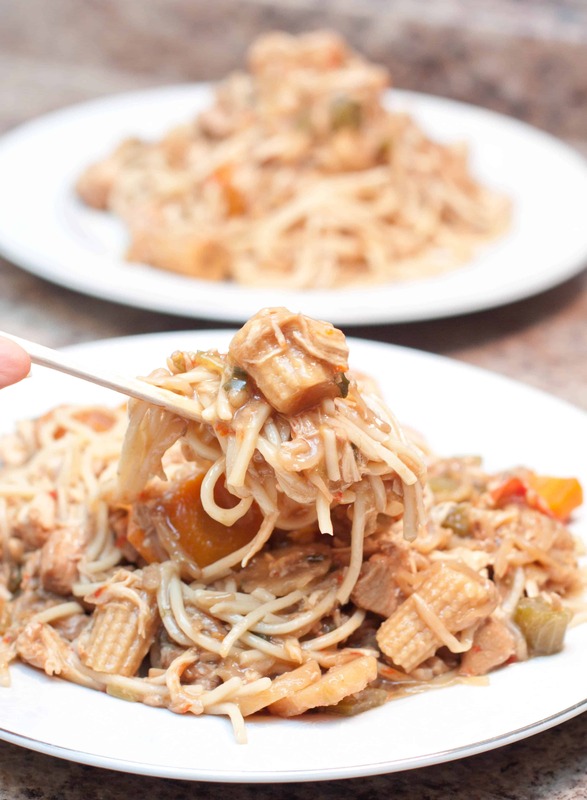 Crock Pot Chicken Chow Mein! It’s like getting take out, but better! Why? Because it’s just as easy. Plus, at home, pants are optional. The hubster and I are not big take out people (in case you couldn’t already tell) and I don’t usually eat a lot of Chinese food, except Dim Sum. But this week, I was bored with our dinners. We both have been busy, and lazy (ok mostly lazy), and have just been making a ton of baked chicken. And by a ton, I mean we’ve had it every night for the last 3 nights. We needed a change, a big change. 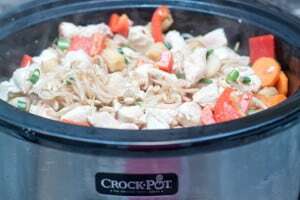 And making Chow Mein in my crock pot has been on my must make list for a loonnggg time, especially after the huge success Chicken Pho was in our crock pot. 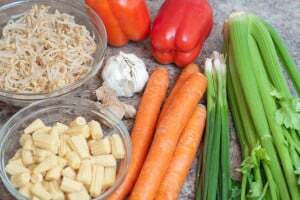 So I dusted off the crock pot and prepped a ton of fresh veggies. Ok, the baby corn, bean sprouts, and water chestnuts (not pictured), came from cans. 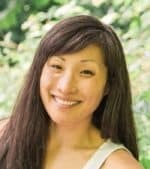 Normally, I’m like booooo canned goods – go fresh! Except when you can’t find said veggies fresh in the one store you’re willing to go to. Did I mention the laziness? then the next morning added the browned chicken, homemade chicken stock some chili paste, and soy sauce and left it to cook all day while we were at work. That evening, I came home to a delicious smelling house. And a whole crock pot full of amazingness. The final touch, I cooked some chow mein noodles (also on my list to make from scratch), and then gave them a quick fry in a little bit of sesame oil before adding them to the rest of the crock pot. 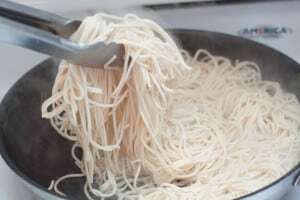 I only fried mine for a few minutes, but I think next time I’ll fry for longer to get even more texture and color on the noodles. 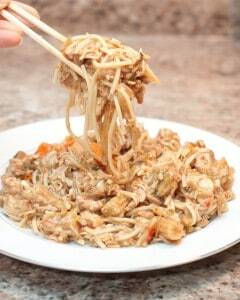 Even still, this Chicken Chow Mein is Spot. On. It was exactly what I was hoping it would be. And even better, I knew exactly what was in it. 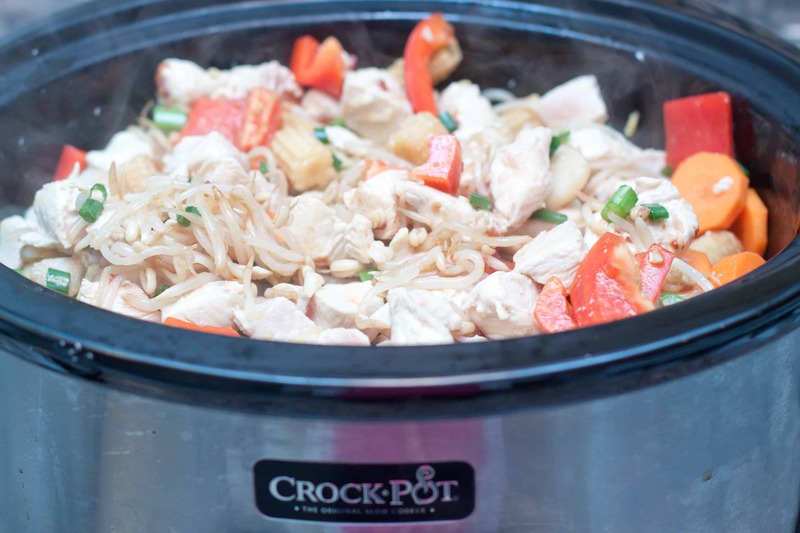 Crock Pot Chicken Chow Mein: The ultimate crock pot weeknight dinner win! 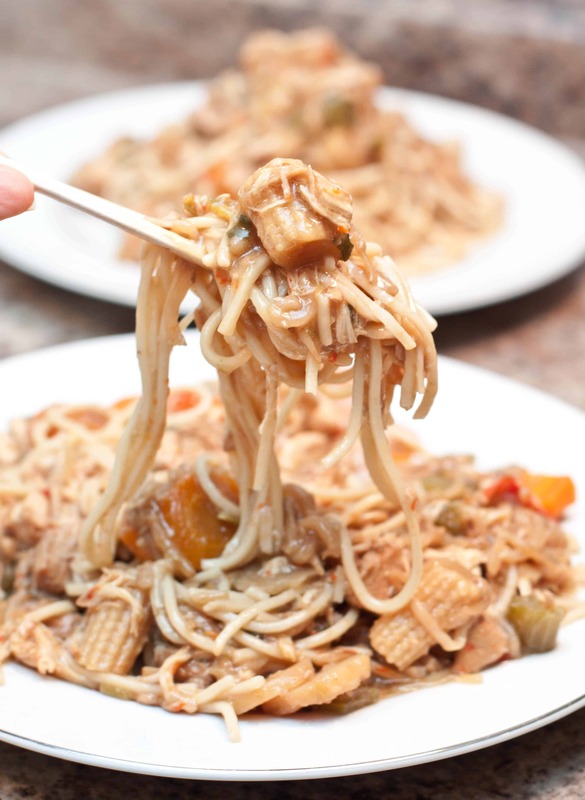 Delicious Chow Mein take out made at home while you work! 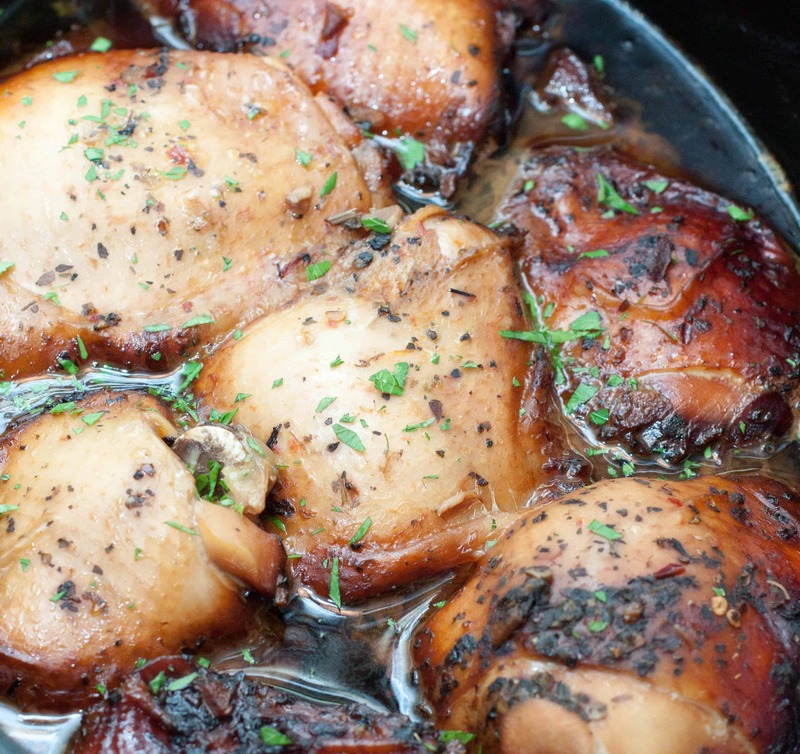 Heat oil in saute pan and brown chicken. 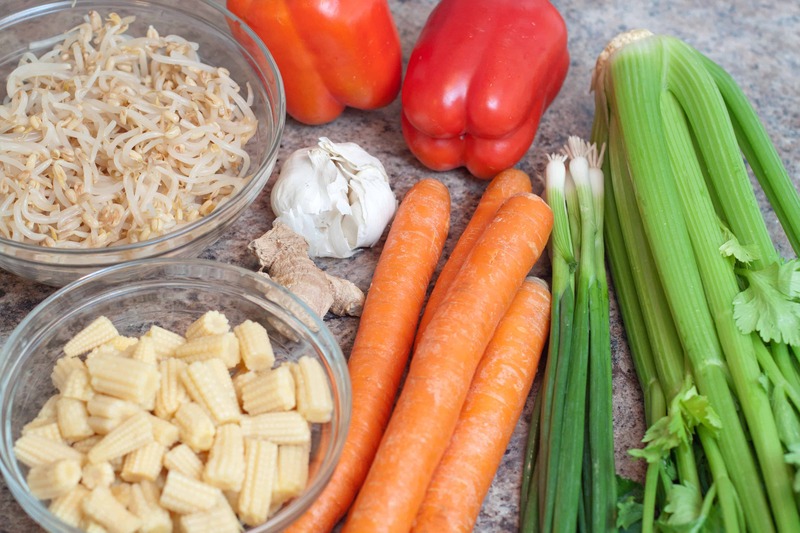 Add chicken to the crock pot and then add veggies, ginger, garlic, and mix. Add chicken broth, chili paste, and soy sauce and mix. Mix the cornstarch and water in a small bowl until cornstarch is dissolved and smooth. 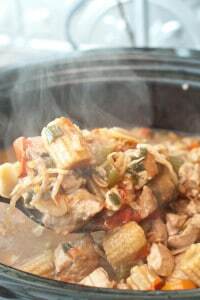 Then turn slow cooker to HIGH and mix cornstarch with liquid in crock pot and cook for 20-30 minutes until liquid thickens. Keep cover slightly open to let steam escape. 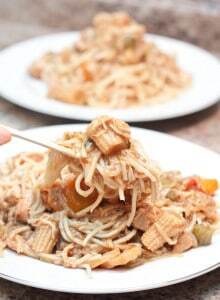 Meanwhile, cook chow mein noodles as directed on package, just a minute less than directed so they are al dente. Drain well. In a large skillet or wok, heat 1 tablespoon of sesame oil on medium/high. 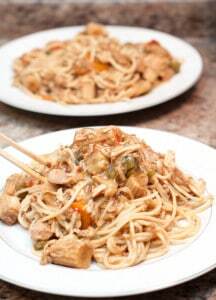 Toss noodles into hot skillet or wok and cook on high for 2-3 minutes. You'll hear it sizzle as the noodles get a nice slightly crispy coating. 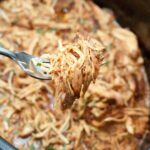 Add noodles to to crock pot, mix, and serve! Wow! 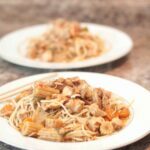 I would never ever think of making a delicious chow mein in a slow cooker; what a delicious and fantastic idea! Thanks so much for sharing this one! Thanks!! 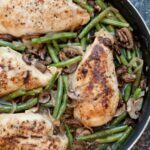 Anything that makes a weeknight dinner easy is a winner in my book! 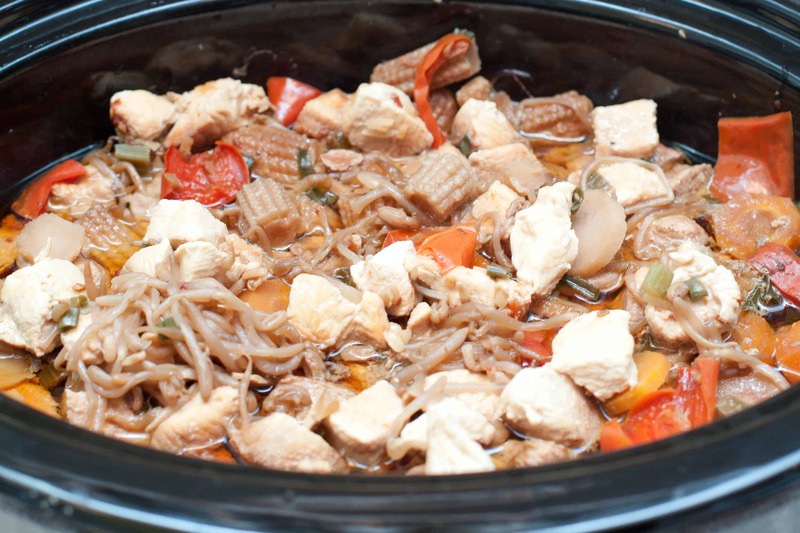 I love using my slow cooker but have never used it to make chow mein before! Or any noodle dish for that matter. Thanks for showing me yet another reason why slow cookers are AWESOME! I haven’t had chow mein in years. 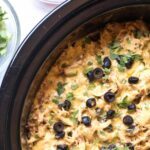 This is a fabulous idea and love that you made it in the slow cooker. I am a HUGE crockpot fan. And I love the fact you can make such awesome food while you are busy doing other things. Who needs takeout when you can do this!! 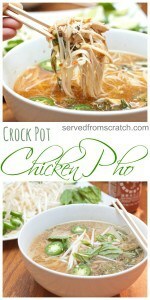 How wonderful, I usually associate most food like this with quick cooking, I gotta give this a go sounds amazing! 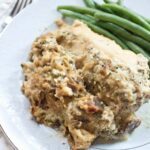 May I please just invite myself over to your house for dinner, because oh my goodness, this recipe looks so good and all your recipes are always SO good! (pinnage happening now). Chow mein was one of the first Chinese dishes I tried besides pepper steak. That might not even be an authentic Chinese dish but my favorite at the restaurant. 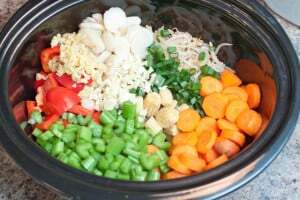 I can make it in the crock pot? I’m in! No take out necessary!